Unusual and one of a kind gifts are the best to give, and Clearly Susan's crystal vases hand painted in a multi colored stripe design is in a class all it's own. 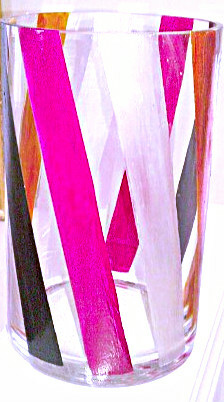 The slanted stripes hand painted in colors of black, transparent white, fuchsia and bright orange give that eclectic flair. If you would love to have a hand painted glass vase painted in a different design than request it in the Special Request Box or email me.